M challenged me to do this, and now I challenge you: draw a picture of your ideal summer. M forgets that I am not a professional drawer type person like she is. But she was very persuasive, and by 'persuasive' I mean she put the fear of god into me, drawing on my powerful, atavistic fear of failure. 'You do not want me to have to FAIL you on this assignment, do you?' she asked, ominously, knowing how cravenly I require approval. 'Noooooo' I whimpered. 'I must not fail. Failure is not allowed. Failure leads to being called up every Sunday by my father and quizzed on the contents of that week's Economist. PLEASE NO'. 'Then do it. WITH COLOURS'. So here it is. It's terrible. On top of being startlingly inept, it's very dark. My flash wasn't working. Sorry, innit. Here are some details, in case clicking on the picture to enlarge it fills you with ennui and hopelessness, which I could quite understand. Once I had taken the pictures I realised I should also have included an end to suffering and world peace and so on, but god only knows how I would have drawn them. My ideal summer would also involve me losing several kilos, particularly off my currently nonsensically large chest, but again, this is not something I wish to essay in the medium of chewed felt tip pen. Erm. I am quite embarassed to post this, but I am more scared of M. Do please do me an inept sketch of your ideal summer, once you have stopped shaking your heads pityingly. Words? Who said you were allowed WORDS?? You get a B for drawings, an A for content, and an F for being a cheating rotter. 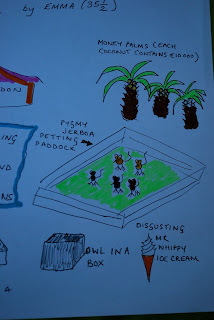 My ideal summer would include a completed brick wall, whole lots of home-grown vegetables that will miraculously grow tall and strong despite lots more sunshine than rain, me relaxing on the lawn every day, me losing half a stone despite scoffing lots of fruit and Montezuma chocolate. I have nothing else to wish for as I am easily pleased. I can't draw. Will this do? If not, just what will you do about it? Indeed, if I do, just what will you do about it? My husband just insisted I eat a second chocolate-covered macaroon. The weight is doomed to increase. Oh dear. Hmph. Fine. For your resit you can draw a three panel comic strip on the theme "Koalas don't matter". I accept my resit challenge, M. I am quite looking forward to it, actually. Could you please add a sweet white canvas tent with a hammock inside and a deck outside with a comfy chair and side table and a radio with remote control so I can be there and listen to NPR (National Public Radio, the best in the U.S.) from the deck while eating squares of Lindt 70% cocoa chocolate bars and reduced-salt dry-roasted peanuts in the cool breezes? I promise I won't bother you at all and I will give you chocolate squares and hands-ful of peanuts upon request. 'macaroon' is one of the best words in the English language. Up there with 'nifty' and 'nosegay'. BP, TransOcean and Haliburton execs are coated in oil from their stupid spill, weighted down and left to broil to death on Louisianna beach. Mojitos for onlookers. Then stock market recovers in time for back to school. Sonshine goes off to somewhere nice every day and comes home in a good mood and goes straight to his bed. Every day for 6 weeks. Nice weather during the day (not too hot because I've got that Scottish thermostat thing going on - 2 degrees either way and I'm roasting or frozen). It can rain during the night. There will be someone to look after the garden. He will be buff and do lots of lawn-mowering with his t-shirt off. He will fancy me. I will have a personal chef who keeps me off the Tunnocks biscuits and pineapple cakes. Somehow, magically, I become 10 stone. Also, somehow, magically, I have nice hair. My friends will come and visit and there will be lashings of laughter and good times and we'll all live happily ever after. Will shed babyweight in the blink of an eye, also the weight from previous baby. Both babies will be quit and peacefull. My grass will learn to take care of itself. The house will learn how to clean itself. There will always be white wine in the fridge. It will be hot, but not to hot. And I will spend the entire six weeks in the easy chair rocking one baby while the other plays in her kiddie pool, in which she will not pee or poop. ...a self-cleaning house...what a fab idea!!! I think we should bring the capybara out. You'll all get Fs for doing NO DRAWINGS. Shame on you. DO IT, M. SUMMON THE CAPYBARA. None of these bastards have done their homework, except Mrs Trefusis. I have hers in my inbox and very well executed it is too. Ernest Hemingway is making us cocktails on the Isle of Wight. I had a weekend of Ideal Summer just before Memorial Day (the official start to summer here in the U.S.). We rented a tiny beach house: You walked off the back patio right into a private, white-sand beach. There was an outdoor gas grill. We grilled seafood every night and sat on the patio and drank lots of wine and watched the ocean. At night, we slept in the loft of the house and fell asleep to the sound of waves. During the day we went antiquing and drove around the pretty countryside or walked around the little beach neighborhood. your post is really very helpful for us.